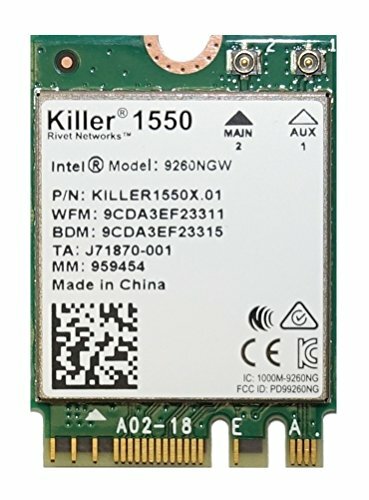 Intel's 5th generation wireless 11ac chipset. provide up to 60% faster download speeds, lower latency, and a better overall connection. to your wireless access point so that the access point can better direct its signals to you. and includes Bluetooth 5.0 connectivity. PLEASE READ: Module is 22x30mm and should only be used in Laptops with an M.2 connector and a standard Key A or E socket. It WILL NOT work in the M.2 slot in a Desktop. The Killer Wireless-AC 1550 delivers up to 1.73 Gbps of throughput and is the ideal networking solution for gaming, streaming, and downloading. Killer Control Center - Killer's state of the art interface gives you the visibility and control needed to perfectly manage your PC's network traffic. If you have any questions about this product by Killer Networking, contact us by completing and submitting the form below. If you are looking for a specif part number, please include it with your message.